When I was little I used to watch ants marching in and out of their anthill homes, bringing food for the colony or hauling out tiny particles of sand and soil as new "rooms" and tunnels were constructed. I wanted more than anything to be able to crawl into one of those tunnels and explore the underground chambers. Books with illustrations of rabbit warrens, fox dens, beaver dams, beehives and the secret interiors of other animal homes fascinated me. As an adult, I find myself curious about the secret chambers of another kind of animal: writers. Writing, as a profession, tends to be a fairly solitary activity. 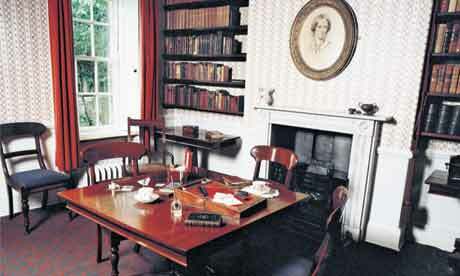 As such, pictures of famous writer's workspaces have been shared and posted and circulated for generations, satisfying our desire to peek into the creative processes and procedures of our favorite authors. 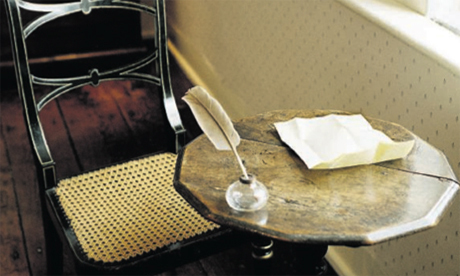 Jane Austen's writing desk. Interesting article HERE. 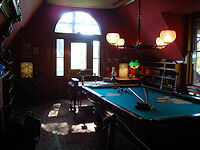 Mark Twain's office (one of them) was in his billiard room. Roald Dahl's writing shed. Lots more pictures HERE. 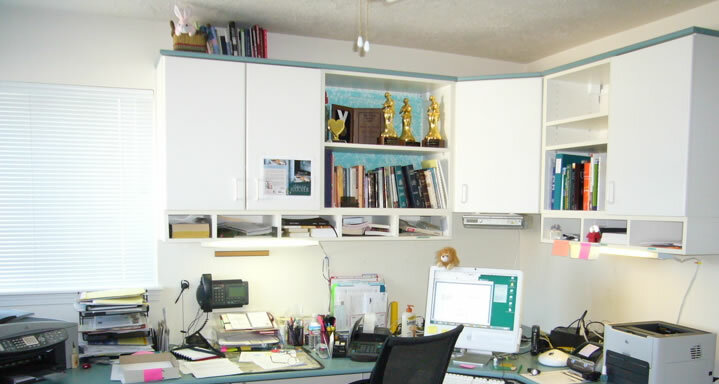 Robin Lee Hatcher's office space. If you're a writer, where do YOU write? Have you tried writing in a coffee shop, like J.K. Rowling? How about writing out-of-doors? Are you chained to your desk, or do you move around? Has anyone tried writing standing up (as Hemingway was said to do)? How much does your setting affect your creativity? ]My writing space tends to be one of three areas. My recliner, my bed, my desk. The idea of hand-writing a novel almost makes me sick when I think of the way I write. oh and Thank God for Laptops! God did an excellent job when He created laptops, a corner of the sofa, and a cat to curl up with. I agree, Elaine. However, my cat became extremely annoyed with me the other day as I continually jostled her to get her girth off my space bar while I awkwardly try to type around her. I have also learned to close the laptop wen I get up, or she lays directly on it! Laptops and cats do make for a very warm lap! I have to write at home, somewhere comfy and quiet. For lighter writing like blogs and editing, I usually take my laptop to the couch in the formal living room by a big sunny window. But for serious novel writing, I sit on my bed hidden away in my bedroom with the door closed. Oh, amen to your comment about laptops, Elaine! I tend to stay at my desk, but I've recently tested out the Starbucks method (works better for editing, I think) and the library method (which was weird). Deb, writing in bed seems to be quite popular among famous authors! And yes, I agree, I cannot imagine writing a book longhand. Ugh. Anybody tried writing on an iPad or a tablet? Oh Niki, I couldn't write on a tablet--nothing beyond a book review or email, anyway--unless I have a keyboard. I hate typing on a flat screen. I write in the office. It just works for me. There's southern exposure so there's plenty of light, and I'm comfy there. I have southern exposure in my little corner, too. It's lovely and warm. Too warm, sometimes! I can write in bed because I sleep with my laptop. This week I've been sitting at my cozy little table by the window overlooking the water - that happens when...like NOW... I am trying to get away from the cat. okay, I'm quitting for the day. off to read more of NO SUBSTITUTE by Susan Diane Johnson! I'm one of those who writes longhand. I don't know why, but it works for me. I can go days and days without turning the computer on. My favorite place to write is the beach. My best place to brainstorm is in the swimming pool during exercise class. I'm not sure why, but my creativity goes crazy in the pool. Fascinating post, Niki. I hadn't seen any of these photos, so it was fun discovering. I have written in the library, at coffee shops, and in vehicles, all with my laptop or mini. The public places seem to spur me on because I hate people seeing me stare into space/daydream, so I start writing whatever comes into my head and that gets the characters in motion. 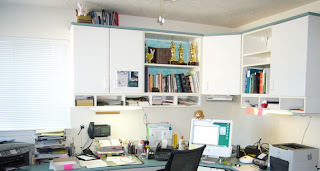 When I started writing at home, I used an armoire in the corner of the living room. I still use it, but only for blogging, social media, and genealogy when I'm with the family in the evenings. When the family is gone during the day, housework calls from every room. Yes, I can write, but it's with a load of guilt. It takes about 30 seconds to walk from my front door over to my office and by the time I walk in and see my 'cave', housework is forgotten and I sink into whatever year I'm writing in. Thanks for including the link to more writing caves because when I saw Dahl's writing shed, it made me wonder what Thoreau's cabin looked like - and there it was! Not only that, but Thoreau's cabin smacked me with a nostaligic memory of Mamma's farmhouse. A question arose as I looked at the inside of Pollan's cabin - does his window face his house? And if it does - is it so he knows when someone's coming so he can greet them, or hide? Or does it face away so it doesn't remind him of what he's missing? I guess that would go for any of the cabins or huts that writers put up behind their homes.